Mt. Zion Memorial Fund: Walter Lee Hood - "Big Daddy"
Big Daddy is a big, gold amoeba sitting motionless on a chair. He wears a 24-karat satin shirt. He has little feet. Up floats a microphone and Big Daddy wiggles, gets hooked in the mouth like a giant goldfish. Out pops a voice, a vibrant, poignant tenor, the sound at first fragile. Then he puts his weight behind it. “Gone buy me a .22,” he croons; a white sweat towel snakes over his shoulder, “don’t...make me shoot the...hell out of you.” The evolution is complete; Big Daddy is now the highest life form of all in a Saturday night bar - a Blues Singer. That he is, says his manager, Jesse Robinson. 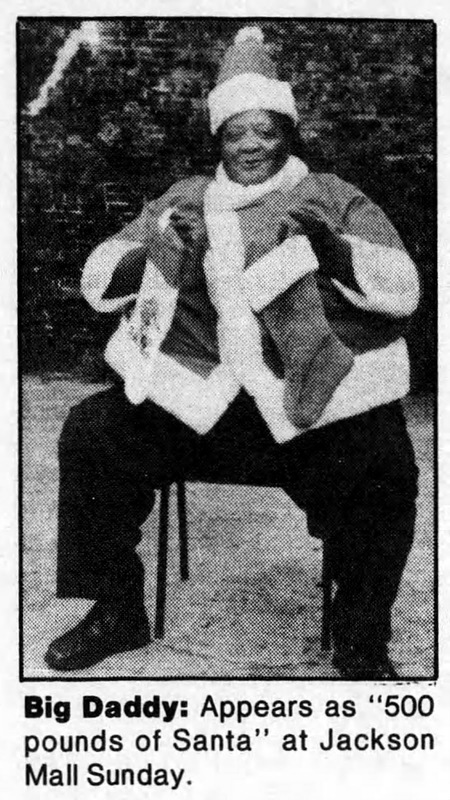 The first time he saw Big Daddy, Robinson was struck by more than the size of this quarter-ton man, known only to local blues fans as Big Daddy. “The first thing he had,” said Robinson, “was his voice. The way he could sing the blues. 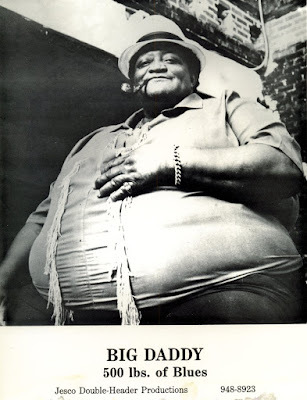 The main thing is a 500-pound man singing the blues. You just don’t find that.” Eleven years ago, you wouldn’t have found it. It has only been a decade since Big Daddy found his blues voice. 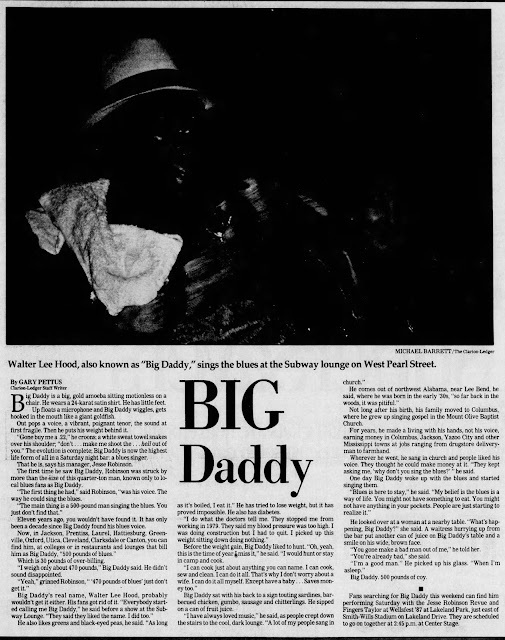 Big Daddy’s real name, Walter Lee Hood, probably wouldn’t get it either. His fans got rid of it. “ Everybody started calling me Big Daddy,” he said before a show at the Subway Lounge. “ They said they liked the name. I did too.”He also likes greens and black-eyed peas, he said. “ As long as it’s boiled, I eat it.” He has tried to lose weight, but it has proved impossible. He also has diabetes. “I do what the doctors tell me. They stopped me from working in 1979. They said my blood pressure was too high. I was doing construction but I had to quit. I picked up this weight sitting down doing nothing.” Before the weight gain, Big Daddy liked to hunt. “Oh, yeah, this is the time of year. He comes out of northwest Alabama, near Lee Bend, he said, where he was born in the early ’30s, “ so far back in the woods, it was pitiful.” Not long after his birth, his family moved to Columbus, where he grew up singing gospel in the Mount Olive Baptist Church. For years, he made a living with his hands, not his voice, earning money in Columbus, Jackson, Yazoo City and other Mississippi towns at jobs ranging from drugstore delivery man to farmhand. Wherever he went, he sang in church and people liked his voice. They thought he could make money at it. “ They kept asking me, ‘why don’t you sing the blues?’” he said. 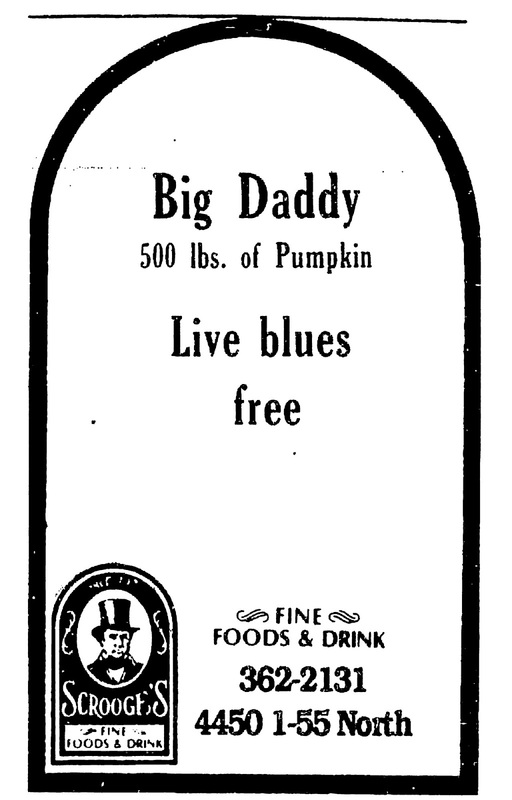 One day Big Daddy woke up with the blues and started singing them. He looked over at a woman at a nearby table. “What’s happening, Big Daddy?” she said. A waitress hurrying up from the bar put another can of juice on Big Daddy’s table and a smile on his wide, brown face. “You gone make a bad man out of me,” he told her. “You’re already bad,” she said. “I’m a good man.” He picked up his glass. “ When I’m asleep.” Big Daddy. 500 pounds of coy. 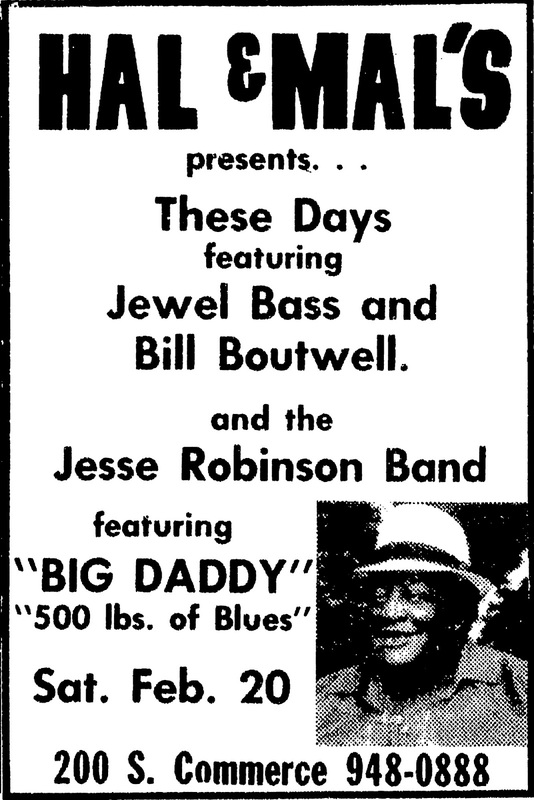 Fans searching for Big Daddy this weekend can find him performing Saturday with the Jesse Robinson Revue and Fingers Taylor at Wellsfest ’87 at Lakeland Park, just east of Smith-Wills Stadium on Lakeland Drive. They are scheduled to go on together at 2:45 p.m. at Center Stage. (Jackson, MS) Clarion Ledger, Sep 23, 1987.